How is it already October?! Didn’t we just go back to school a couple weeks ago? According to my calendar, we’re almost half way through the semester! Along with October comes lots of fun things: sweaters, pretty colors on the trees, pumpkin everything and, here at While He Was Napping, October Spooktacular. It’ll be a month full of fun Halloween posts to help you get in the spooky spirit, and, before you know it, All Hallow’s Eve will be upon us. Make sure to check out the archives from the pat five years too, for even more fun Halloween ideas. A month seems like a long time, but I often find it’s not. 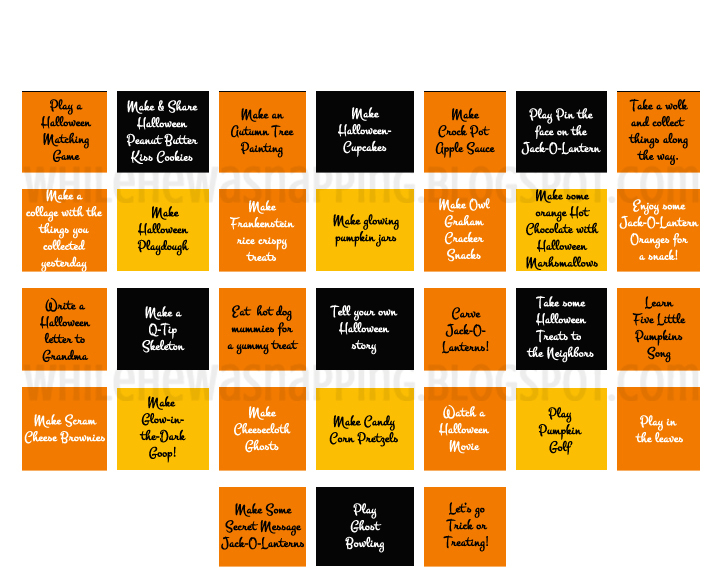 I created a Halloween Bucket List for us to use so that we can make sure we get all the haunting good fun we can manage out of Halloween before it’s gone for another year. My mom doesn’t like Halloween, so we didn’t do much to celebrate it when I was growing up. 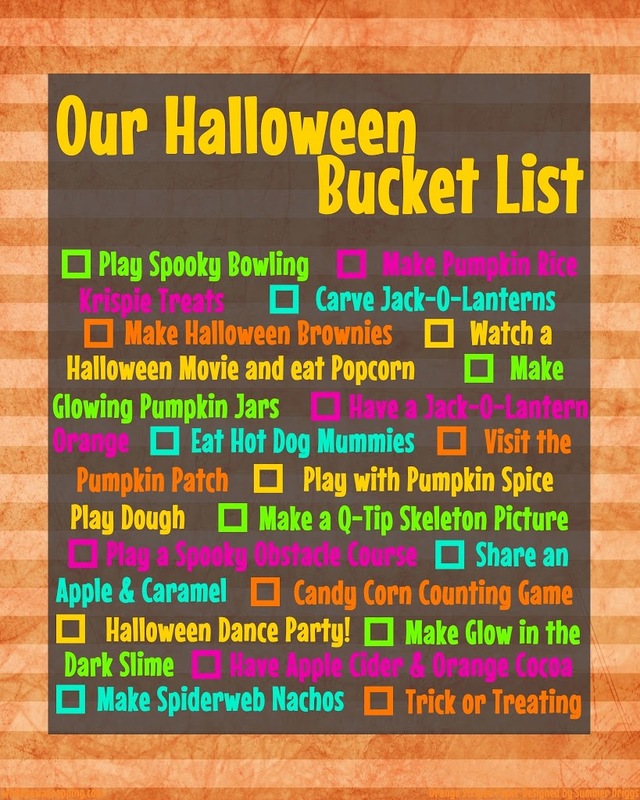 I enjoy doing fun Halloween activities with my boys and I want them to have some fun memories of the Halloween season when they get older. To get your own FREE copy of this fun printable, click on the image above. Another window will open and you can download the file and save it to your computer. Then print it. 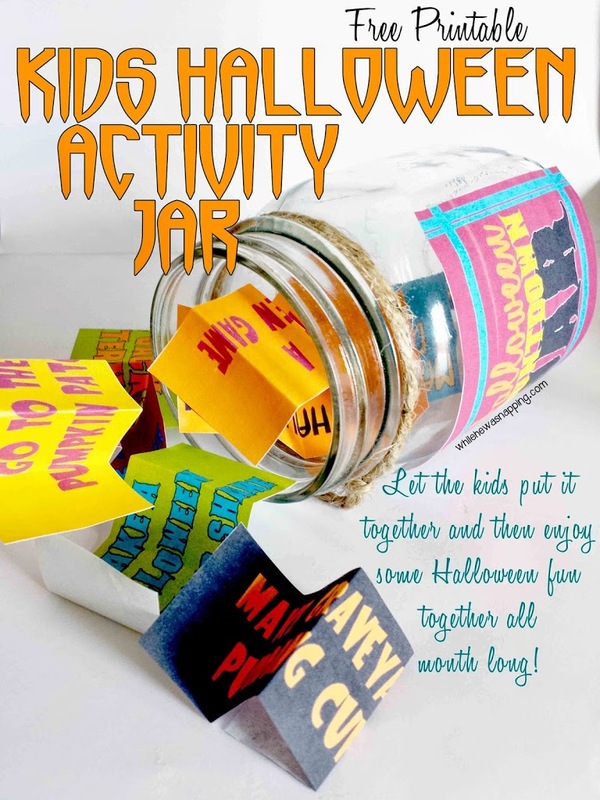 You can frame it and mark off the completed activities with a dry erase marker… or just let the kiddos color in the Jack-o-lantern after you do the activity. That’s the route we’re taking this year – simple. We use this one as more of a boredom buster jar for when we need something to do and my boys are having a hard time coming up with something. I don’t have to spit out idea after idea because they are in a whiny mood and shoot down every suggestion. They pick a slip and they can do that or go play in their room. I did this one with Big J back when he was my only crazy boy, but I think I will try it with my younger boys this year… I always have a had time finding things to keep them out of trouble. Their attention spans don’t seem to be as long as Big J’s was at this age. I’ll take all the ideas I can find! 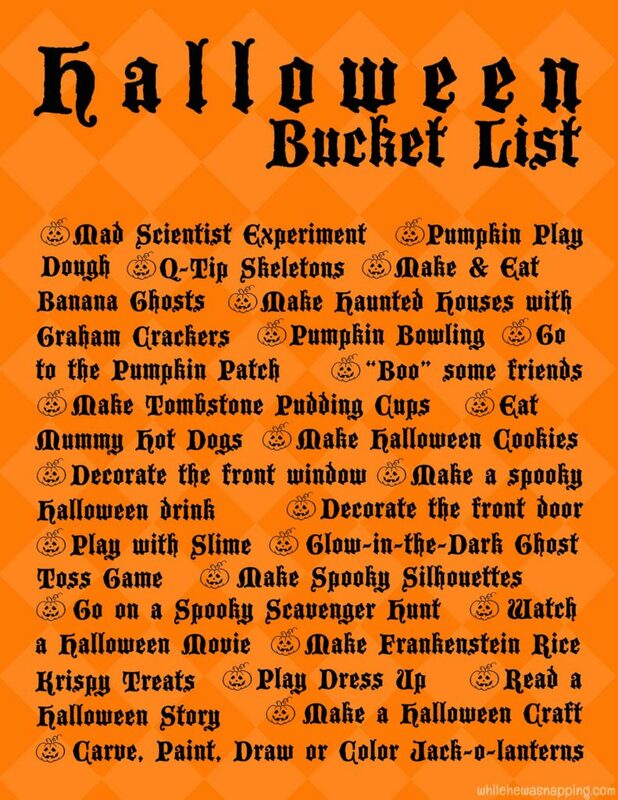 More fun activity ideas from our Halloween Bucket List of a couple years ago. I can’t believe Halloween is all but here! Are you ready? If you’re looking for one more Halloween project, you’re in luck! I’ve got one last quick little project for you before Halloween has come and gone and I have to save this for a whole year. The best part: It’s quick and simple. And delicious! 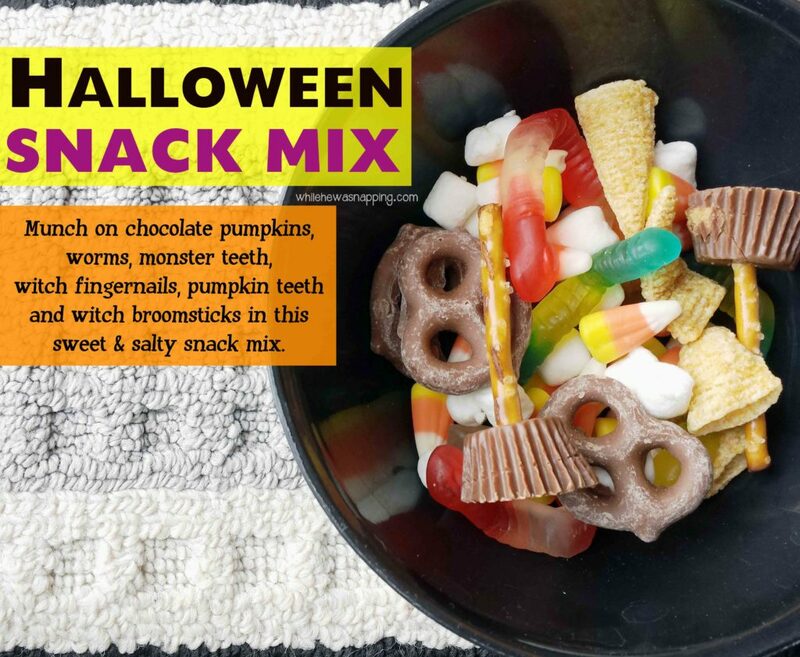 A fun Halloween Snack Mix that is perfect for your celebrations. Of course, you should adapt the ingredients to fit those eating your snack mix. These are ideas and the ingredients I used in our snack mix. * I suggest checking the bulk section, if your grocery store has one. You can get things in the quantity that you need and it’s usually cheaper than the pre-packaged items. And that way you can leave out what you don’t like and put in what you do. – Mix all ingredients together in a large bowl. Divide into serving sizes, if desired. Serve. Seriously. How easy was that?! 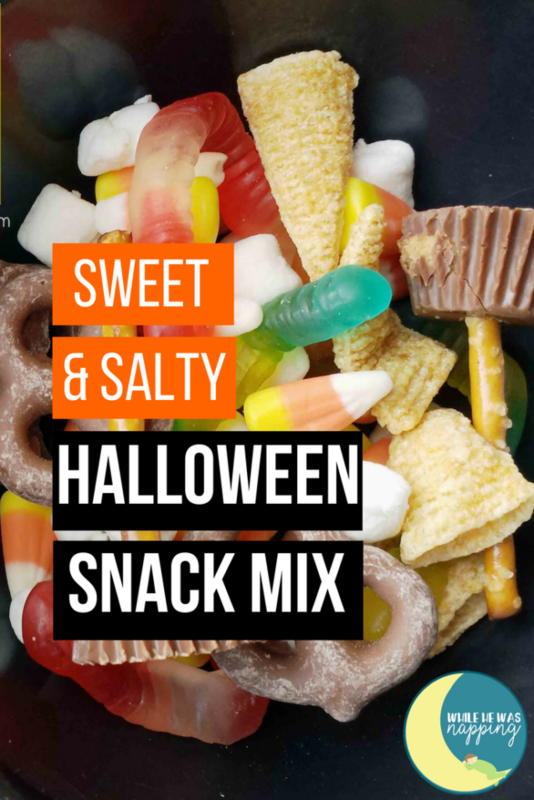 What I love about this mix is that it’s a great combo of salty and sweet, as well as crunchy and soft. Yum. There’s something to make everyone happy. Pick and choose your favorites. Make it the way you like it. If you’ve been around here much, you know I love being able to customize things so they fit our family. Another great perk: this was a great project to do with my boys. What little kid doesn’t love a quick and easy project they get to eat afterward? Okay, admittedly, I like that too. Projects you can eat are the best kind of projects! 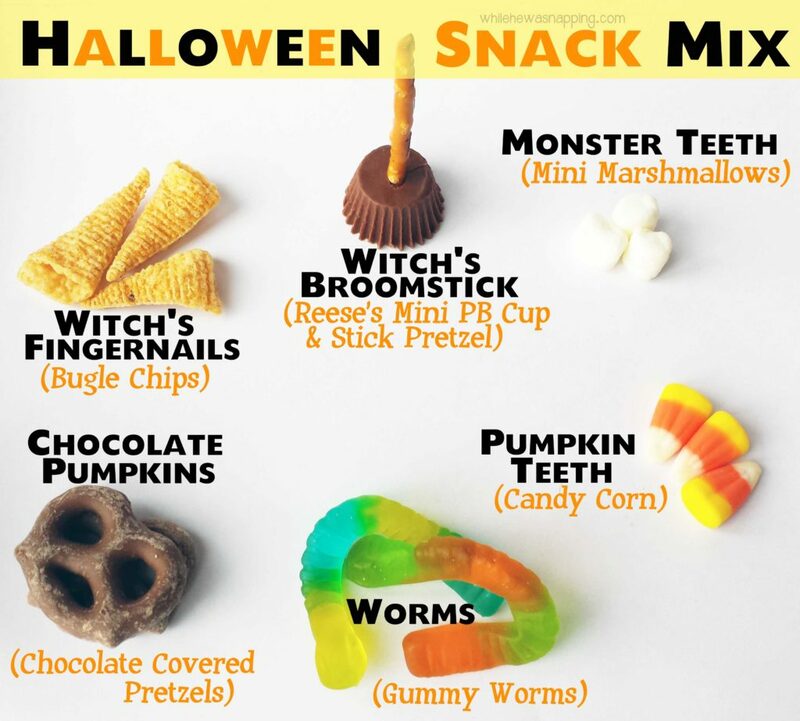 Package up this fun Halloween snack mix in little ziptop bags and put a Monster Mash Baggie topper on it for an extra festive spooky gift!